MPA Networks has the experience to handle your situation. A turnkey solution for your next-gen workspace. Our hosting solutions give your team the freedom to focus on innovation. 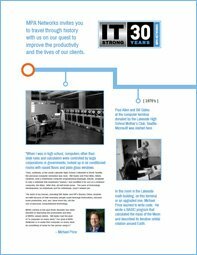 We keep your IT system running fast and your employees productive. Our deep IT expertise allows you to focus on your core business. MPA Networks is the most trusted provider of IT services, including computer and network managed services, in the San Francisco Bay Area. IT-Strong for 35 years, our unparalleled experience and long list of satisfied clients give us the knowledge to handle complex network challenges.